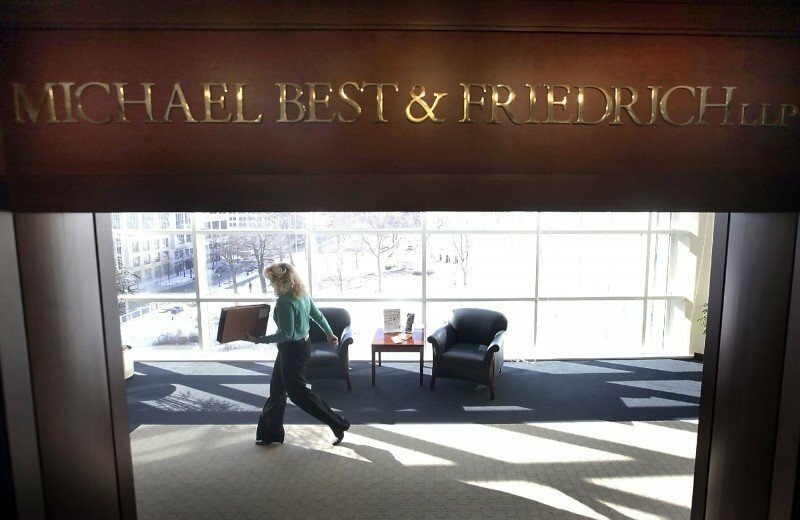 In just over a year, Michael Best & Friedrich has become the go-to law firm for Wisconsin's Republican leadership. The firm has become so associated with Gov. Scott Walker that some critics have taken to sarcastically calling it the "Shadow DOJ" (Department of Justice). The news last month that a conservative Supreme Court justice had received two years of free legal service while fighting an ethics charge was just the latest indication of an increasingly cozy relationship between the Republican Party and one of Wisconsin's most prominent law firms. The state is going through a particularly litigious period in its history, with nearly every piece of major legislation facing some kind of legal challenge. As a result, the most influential three names in state politics, outside of Walker, Fitzgerald and Fitzgerald, just might be Michael Best & Friedrich. "They seemingly have a dog in every fight," said Mike McCabe, executive director of the Wisconsin Democracy Campaign, an organization that tracks money in politics. "I can't remember seeing one firm so entrenched in every area of politics before. They have essentially become the in-house counsel for the Republican Party." The Wisconsin Democracy Campaign, at the request of the State Journal, investigated Michael Best & Friedrich's political donations and discovered that when it comes to contributions, the firm is as politically savvy as it is ideological. Since January 2005, lawyers from Michael Best & Friedrich have donated $317,800 to Democrats and $225,753 to Republicans. Democrats were in power for much of that time. That trend continued for the first six months of 2011, where the firm gave $4,675 to Democrats and $4,300 to Republicans. The Wisconsin Democracy Campaign hasn't crunched the last six months of fundraising yet, a period which includes the parts of two expensive recall campaigns. Lester Pines, a prominent liberal-leaning attorney with Cullen Weston Pines & Bach, which has handled dozens of political cases, said Michael Best & Friedrich owes at least part of its GOP workload to its specialized skill set. Founded in 1848, the firm employs more than 220 attorneys and can count among its numbers a former counsel to the governor, two former deputy attorneys general and two former assistant attorneys general. "There are just not a lot of firms that can do what they do," Pines said. The governor turned to Michael Best & Friedrich not only when his landmark collective bargaining bill ended up in court, but also for advice on drafting mining legislation, to fight aspects of his recall election and to represent him in the ongoing John Doe investigation. Meanwhile, Republican senators turned to the firm for help with recall elections this past summer, and leaders of the state Senate and Assembly hired the firm to help draft the state's 10-year redistricting plan — and defend it in court. Michael Best & Friedrich's managing partner David Krutz said in an email that he does not believe the firm is overly involved with state government. He said his firm has been chosen often because "we have very experienced lawyers who understand state government and how to achieve results for our clients." The relationship with the GOP has netted the firm well more than $750,000 in legal fees since Republicans took control of the state last January, a tally that includes fees for work on redistricting, mining legislation and parts of work on Walker's recall campaign and John Doe investigation. Those are the contracts that have been made public. Several others have not. According to Senate Majority Leader Scott Fitzgerald, R-Juneau, Michael Best & Friedrich is worth every penny. "When you need someone to handle a lawsuit, you don't want to spend a lot of time educating them on legislation and politics and whatever it is you need handled. This is very specific stuff, and Michael Best & Friedrich is one of the few firms that know how to do it." The firm on Jan. 3 received a stern condemnation from the U.S. District Court in Milwaukee over its handling of parts of the redistricting lawsuit. The judges accused the Republican leaders, and the firm itself, of "stonewalling," and "dragging their feet" in the case and were ordered to pay $17,500 in attorney fees. It was the second time Michael Best & Friedrich made unflattering headlines in less than a month. 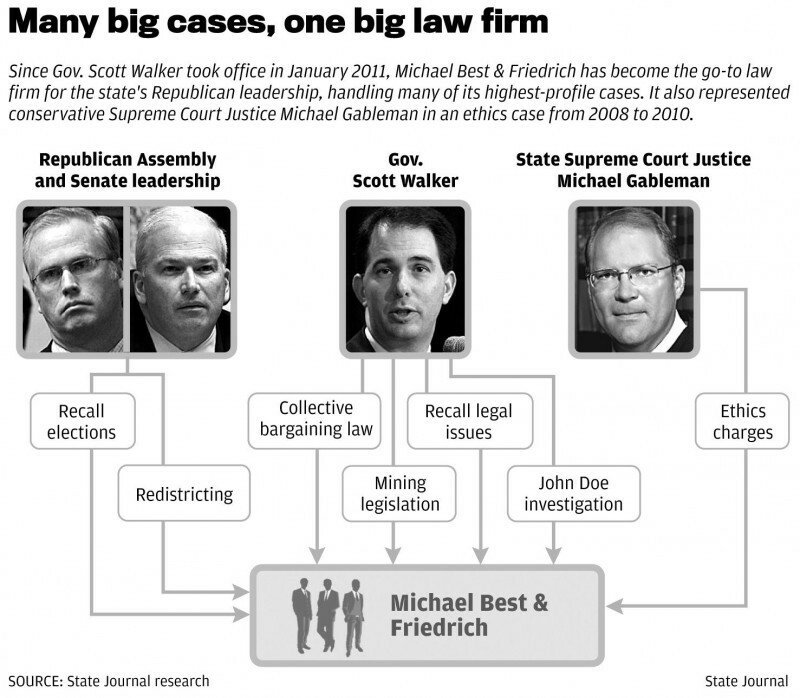 In December news broke that Wisconsin Supreme Court Justice Michael Gableman, a well-known conservative, had received about $100,000 worth of free legal services from a Michael Best & Friedrich attorney. The revelation created a controversy because the Supreme Court presides over cases argued by Michael Best & Friedrich. Accepting free services from the firm could be considered a conflict of interest. The attorney, Eric McLeod, also served on the Walker's judicial selection commission, a post from which he resigned after the arrangement with Gableman became public. Krutz said Michael Best & Friedrich provides legal assistance, regardless of party affiliation, and said that given how contentious the atmosphere around the Capitol is these days, it is not surprising so many issues end up in court. And as for the judicial knuckle-rap the firm received, Krutz said the firm has handled redistricting cases for more than 20 years and is used to the strong feelings they engender. "The court's order made clear what type of litigation conduct and cooperation it expects of the parties in the case," he said. "We have complied with the court's order, and hope to return the focus of the case to the merits going forward." Wisconsin Supreme Court Justice Michael Gableman said Friday he won't recuse himself from three cases, including an attempt to reopen last year's decision that allowed Gov. Scott Walker's contentious collective bargaining law to take effect. Rep. Kelda Helen Roys, D-Madison, is calling on the Legislature to remove Wisconsin Supreme Court Justice Michael Gableman from office, citing his decision to sit on 11 cases involving a law firm that gave him free legal services. Dane County District Attorney Ismael Ozanne on Friday asked the state Supreme Court to vacate its decision upholding the controversial law curtailing collective bargaining rights for most public workers — and to do it without Justice Michael Gableman. Michael Best & Friedrich has popped up in so many cases recently that some around the Capitol have taken to sarcastically calling it the "shadow DOJ." But an analysis of records kept with the Secretary of State shows that while the governor's use of special counsel contracts do seem more common these days, Michael Best & Friedrich isn't handling an unusual number of them. Governors seek such counsel when the state Department of Justice declines to handle a lawsuit. DOJ spokeswoman Dana Brueck said the agency has to consider several factors when deciding whether to take a case, including the department's limited budget, specific expertise needed and the size and complexity of the lawsuit. For example, last February, DOJ turned down Walker's request for help with the controversial budget repair bill, saying it lacked enough nonunion staff members with employment and labor expertise to handle the case. In his last two years in office, Gov. Jim Doyle used outside counsel 23 times, including Foley & Lardner five times, Cullen Weston Pines & Bach three times, Quarles & Brady twice and Michael Best & Friedrich once. Out of the 15 times Gov. Scott Walker has used outside counsel in 2011, he twice turned to Michael Best & Friedrich. No other firm was used more than once.